Do you want the famous plexi sound, but at manageable levels ? The Gold digger is the one for you. Raw and powerful sound, nice clean and warm crunches. At lower gain settings, you’ll get the loose and thumping typical hendrix sounds, with just a little bit of breakup. Warm and bright at the same time, ideal with a stratocaster in neck or intermediate position. Add a little bit of delay with modulation, for example with our fantastic sounding Heartbeat delay. Medium gain settings are in the like of early AC/DC sounds. Little bit tighter and punchier in the bass, but keeping open highs. Slightly aggressive vintage sounding crunches, perfect with a vintage SG or LesPaul guitar, super reactive to your playing and volume pot changes. Higher gain settings opens to new territories. Think of vintage hard rock sounds. More controlled bass, creamy mediums and an overall aggressive sound. Use it with vintage hot humbuckers for typical hard 80′ sounds and more. If you need even more gain, use our widely acclaimed bi-boost, it will do wonders with the Gold Digger. 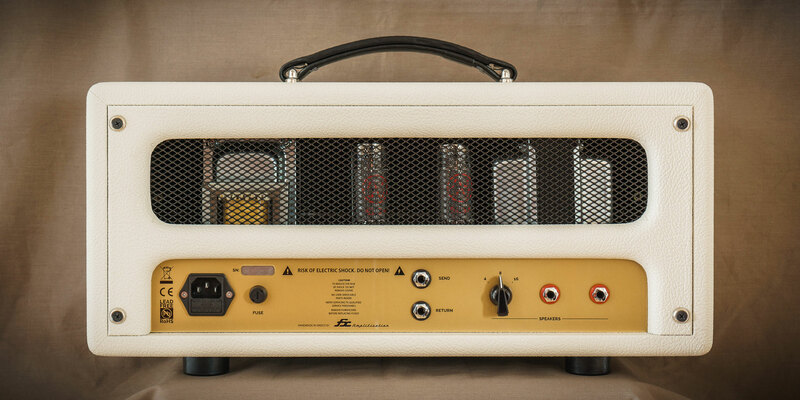 The Gold Digger, as well as all our amplifiers, uses the same big sized tubes as your favorite vintage stacks. It gives better sounding amps, even a low volumes, with a nice amount of bass, and more than enough punch. The Gold digger introduce the new True dynamic technology. So now your Fx amplifier not only provide fantastic sounds even at very low levels, but you’ll also get the true feeling of a pushed 100w stack. The Gold digger is designed to play at any level, even at very low level at night. It also has a 20w/2w for the most quiet conditions. Our famous master volume is also super progressive, so you can set the volume precisely. Like all other Fx amplifiers, the Gold digger is entirely hand wired, with lot of care, using point to point techniques, and only selected high quality components and part. An amplifier that will not let you down.